You might already know Sarvi, she is one of the moderators in the discussion forums and her Flickr username is hemoglobinhummingbird. She created this amazing indigo Jump Rope Dress. Using the shibori technique, she dyed the fabric using an indigo dye kit. See the photo of the boards and claps she used for setting up for the indigo dye. Maybe you remember this post last year where Liesl and S tried out shibori. What a fantastic idea this is to do with kids for the Kid Art theme that will be going on during Kids Clothes Week July 21-27. 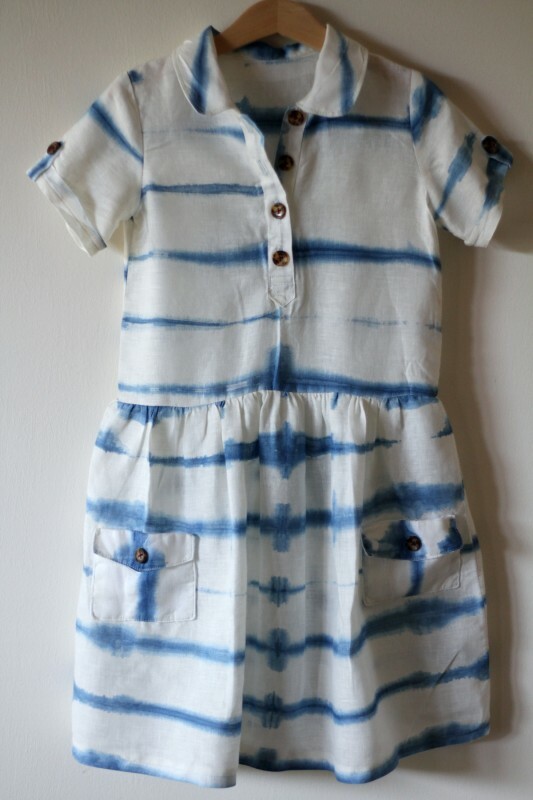 Dye some fabric with a child and then sew them up some clothes using that fabric! This is exquisite! Brava Sarvi!! Its absolutely stunning and I am very lucky as my daughter is on Sarvi’s hand-me-down list……. Thank you so much, ladies! Dyeing the fabric was SO much fun, I strongly recommend that anybody who has the outdoor space try it out. It does get a wee bit messy but it isn’t at all difficult and it’s just so satisfying. It gorgeous Sarvi! One of my very favorites that you made to date! I hope to try something out like this one day. Thank you for all the encouraging comments, they’re so appreciated! I love, love this. Great work Sarvi. Thank you so much, ladies! The encouraging comments are so cheering! UNIQUE AND CREATIVE IDEA OF DYING FABRIC AND SEWING CLOTHING . . . it’s “spot on,” Sarvi! I’m certain you get many compliments when your girl wears her one-of-a-kind hand-dyed dress out and about. CONGRATS to you for sewing lots of love into this dress.